I have recently spent some time discussing how I select the beers that get reviewed on Hoppy Boston. It is usually a combination of recommendations, buzz and some random choices. There is one situation that will almost always result in a purchase; when I walk into a bottle shop and see beers from a New England brewery that has recently started to distribute in Massachusetts. This is especially true if the brewery leads their release with an interesting style (namely anything other than a standard IPA). On a recent trip to my local Craft Beer Cellar I noticed a new-to-me beer from 603 Brewery in Londonderry, NH. This beer is 18 Mile Rye Pale Ale, one of 603’s flagship beers. 18 Mile Rye Pale Ale is named after the 18 miles of coastline in New Hampshire, the shortest (non-zero) coastline of any US state. One of the towns on the New Hampshire coast is named Rye, so a rye based ale seemed like a perfect style choice. The beer is brewed with a combination of rye and pilsner malt along with European noble hops. 18 Mile Rye Pale Ale is available year round on draft and in 12 oz. cans. 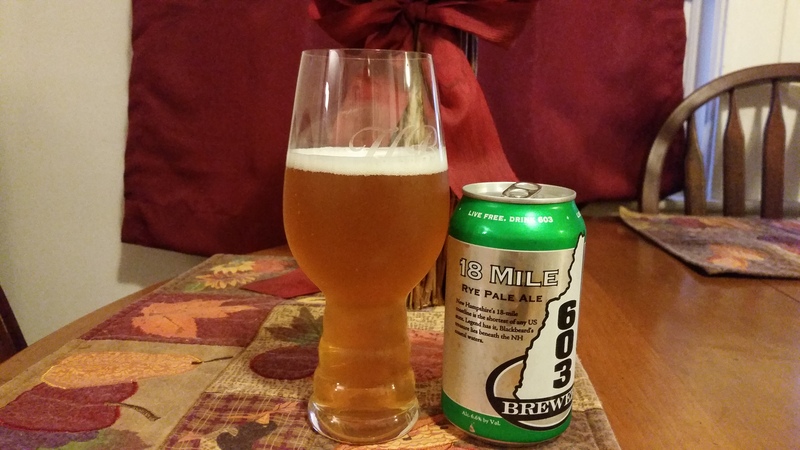 603 Brewing 18 Mile Rye Pale Ale pours a hazy copper with a mild white head. The scent is a mixture of herbal and grassy hops along with some spicy rye. Some brewers use rye as a specialty grain that just adds a little complexity, but 603 adds a substantial dose of rye malt flavor to this beer. The rye adds earthy and spicy character along with some bready notes from the pilsner base malt. The noble hops complement this flavor with touches of cut grass, pine, earth and lemon along with a dry bitterness. The beer is clean and easy to drink at 6.0% ABV. The finish is crisp with some lingering rye and hop flavors. I am a fan of rye as a beer ingredient, and when something is labeled as a rye ale I want to taste the rye, so I really enjoyed 18 Mile. Looking forward to trying some more 603 brews now that they are available in MA! Hoppy Boston score: 4.25/5.